Minardi was an automobile racing team and constructor founded in 1979 by Giancarlo Minardi. It competed in the Formula One World Championship from 1985 until 2005 with little success, nevertheless acquiring a small but loyal following of fans. In 2001, Minardi sold his team to Australian businessman Paul Stoddart, who sold it to Red Bull in 2005. The team is now known as Scuderia Toro Rosso, Italian for Team Red Bull. During its time in F1, the team scored a total of 45 championship points (although under the modern points system this number would almost quadruple). Just over half of these were taken by the team's first driver, Pierluigi Martini. Martini also recorded the team's only front row start and actually led a lap during a heroic performance in 1989. In spite of this, the team never achieved a podium finish in its history, only managing a best place of 4th three times: Martini twice in 1991 and Christian Fittipaldi in 1993. The Minardi family has a longstanding involvement in motorsport. The family has run a Fiat dealership since 1927. Giovanni Minardi competed in his own cars in the late 1940s and after his death his son Giancarlo took over the racing part of the family business. He ran customer cars in Formula Two under various names from 1972 to 1979 - even briefly running a customer Formula One Ferrari 312T as Scuderia Everest in 1976 - before gaining financial backing from well known Italian motor racing patron Piero Mancini in 1979 to set up the Minardi racing team as a constructor.Constructors: Minardi www.grandprix.com Retrieved 2 August 2006. 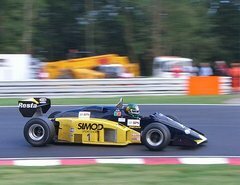 The Minardi team first competed under that name in the 1980 European Formula Two championship. Rather than using a customer chassis, the team commissioned a BMW powered design from Giacomo Caliri's FLY studios - previously responsible for the Fittipaldi Automotive team's F5A Formula One car. Giancarlo led the Minardi team to four moderately successful Formula Two seasons with a variety of young Italian and South American drivers, including Alessandro Nannini and Johnny Cecotto. The team's most notable result being a 1981 win at the Misano round by Michele Alboreto. There was little success initially competing with Motori Moderni until 1987 and then Cosworth engines. The team picked up in competitiveness and by 1989 had become top entrant for Pirelli's return to Formula One. The team were moderately successful in the midfield through the early 1990s, giving a succession of Italian drivers their first chance at the top level, including Alessandro Nannini, Pierluigi Martini and Gianni Morbidelli. Martini in particular was synonymous with the team, eventually having three spells with the team. He drove for them on their debut in 1985, scored their first point in the 1988 USA Grand Prix, took their only front-row start at 1990 USA Grand Prix (aided by special Pirelli tyres; several of their other drivers had surprise qualifying results that day), their only lap leading a race in the 1989 Portuguese Grand Prix, and scored their joint-best F1 result of 4th. Through the mid-1990s the team was the nucleus around which the community of Italian Formula One constructors collapsed. It was the first team in modern times to make use of engines from Ferrari in 1991 and later used Lamborghini V12s for a season. As the number of small teams shrank, Minardi slipped from the mid-field towards the back of the grid. Money woes hit and in 1994 Minardi joined his team with Scuderia Italia in an effort to survive. Giancarlo retained 14.5% with the remaining 15.5% distributed between the Scuderia Italia investors (Emilio Gnutti, Giuseppe Lucchini and Vittorio Palazzani) and Defendente Marniga. 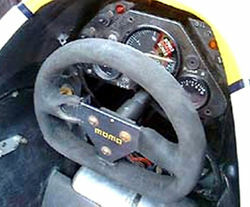 The Minardi team was then controlled by Flavio Briatore. In 1996 Italian businessman Gabriele Rumi, former owner of the Fondmetal team switched his sponsorship support from Tyrrell to Minardi. He would gradually increased his interest in the Faenza outfit, becoming co-owner and chairman. For the 2000 season the team were forced to use 1998-spec Ford Zetec-R V10 engines, which were rebadged as Fondmetal engines in deference to his financial input. However, Rumi had contracted cancer, and was forced to withdraw his backing in 2000. The team, near collapse, was purchased by Australian businessman Paul Stoddart in early 2001, merging it with his European Racing Formula 3000 team. During its final years, the Minardi team was almost as famous for its politics as its racing. Stoddart was described as the Formula One teams' unofficial shop steward. During his time as team principal, Stoddart campaigned for reduced costs in the sport. He appealed to the competing car manufacturers for an agreement where the independent (and, on the whole, financially weaker) teams in Formula One would get cheaper engine deals than at present. In return, the team principals who would benefit from this would support the works teams when it came to opposing new rule changes enforced by the FIA, such as the proposed ban on traction control. Before the start of the 2004 season, he threatened to withdraw his support against the ban on traction control, but later withdrew this threat. Before the 2005 Australian Grand Prix Stoddart initially threatened to withdraw his cars if they were made to comply with the revised regulations for 2005. Stoddart claimed that Minardi could not afford to adapt their cars. Once again Stoddart ended up withdrawing his threat. Stoddart has also repeatedly called for the resignation of the FIA's President, Max Mosley, particularly in the aftermath of the 2005 United States Grand Prix. One of Minardi's most famous performances came at the 2002 Australian Grand Prix. It was Australian driver Mark Webber's first Formula One race. At his and Stoddart's home grand prix he brought the car home in fifth place to score two World Championship points — a rare occurrence for Minardi. Minardi was represented in 2004 by two rookies, Italian Gianmaria "Gimmi" Bruni and Hungarian Zsolt Baumgartner. During the year, they celebrated their 20th season in F1. Baumgartner scored Minardi's first point in more than 2 years at the United States Grand Prix, finishing 8th (only 8 cars finished the 2004 USGP). Baumgartner was also the first Hungarian to score a point in a World Championship F1 race. In 2005, Minardi's drivers were Christijan Albers and Patrick Friesacher. They amassed a comparatively astronomical total of 7 points following the debacle of the 2005 United States Grand Prix, in which they finished fifth and sixth (of six runners) respectively. 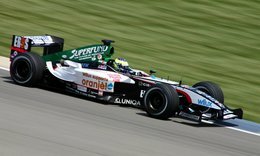 After his sponsors stopped paying him before the 2005 German Grand Prix, Patrick Friesacher was to be replaced by Dutch Jordan test driver Robert Doornbos to create the first ever all-Dutch driver line-up in Formula One history. Before Minardi's demise, they were a particularly well-liked team on the Formula One circuit for many reasons. In the paddock, they were noted for their friendliness, accessibility, and lack of corporate culture (they were universally regarded as having the best espresso in F1). On the track, their cars were regarded by many as well-designed for their tiny budget, their lowly position more a function of lack of funds (and engine power) rather than a necessarily poor car. They also resisted pay drivers better than most other financially strapped teams, producing an impressive alumni including Grand Prix winners Alessandro Nannini, Giancarlo Fisichella, Jarno Trulli and current World Champion Fernando Alonso. It has also provided drives for Indycar winners Christian Fittipaldi and Alex Zanardi. Paul Stoddart stated that he would sell Minardi if he could find the right buyer. Stoddart claimed that he had 41 approaches. His criteria for a sale was the ability of a buyer to move the team forward and leave the team based in Faenza. The drinks manufacturer Red Bull, which already owns another Formula One team, Red Bull Racing, decided to set up a second team to promote American drivers that have risen through its young driver programme, Red Bull Driver Search. Ending several weeks of speculation on September 10 2005 Red Bull announced it would take control of Minardi in November and run it as their "rookie team" from 2006. Crucially for the future of Formula One after the current Concorde agreement expires, the purchase of Minardi by Dietrich Mateschitz gives another supporter for maintenance of the current series. Minardi fans worldwide immediately started an online petition to save the Minardi team name and the team's 20-year heritage in F1 after the news broke. The petition was not successful and it was announced that Minardi would be re-named as the Squadra Toro Rosso team for 2006, later changing that further to become Scuderia Toro Rosso. This simply means Red Bull Team in Italian. Two separate announcements offer the possibility of the Minardi name returning to racing. On March 28 2006, Paul Stoddart declared his intention to enter a Formula One team under the title 'European Minardi F1 team ltd' for the 2008 Formula One World Championship. His application was unsuccessful, as Minardi was beaten to the position by David Richards' Prodrive outfit. On January 30 2006, Giancarlo Minardi announced that he had bought back the rights to use the Minardi name in racing from Paul Stoddart. He also announced a partnership in the junior Euro Formula 3000 series with established team GP Racing - to be entitled 'Minardi Team by GP racing'. The team have raced with moderate success to date, scoring a podium in each leg of the Spa round in June 2006. On 3 October, it was announced that Minardi would combine forces with the Piquet Sports team in the GP2 Series for 2007. This is because Nelson Angelo Piquet has graduated from the series, and the team bearing his name is no longer needed to advance his career.